The Over/Under gun was a combination rifle/shotgun for hunting a wide range of game. The distinctive gun clip will please any gun enthusiast. The top of the pen has a 12 gauge shotgun shell styling. 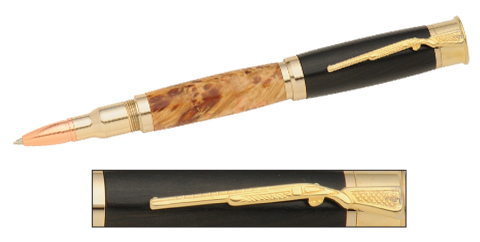 The bottom of the pen is modeled after a .30 Caliper bullet and features a rose gold tip. The top of the pen screws on and off the body. This Rollerball Pen has a bolder line. Two sizes of tube are used with this pen, a 9/16" and a 12.5 mm. This project is turned on our standard pen mandrel with the bushings offered below.